Download the top 10 reasons companies recommend Paycom. Download 7 Tips When Switching HR and Payroll Companies, for free. Subscribe me to Paycom's email updates. Employees who actually use their vacation and sick days are more productive and less likely to get injured on the job. 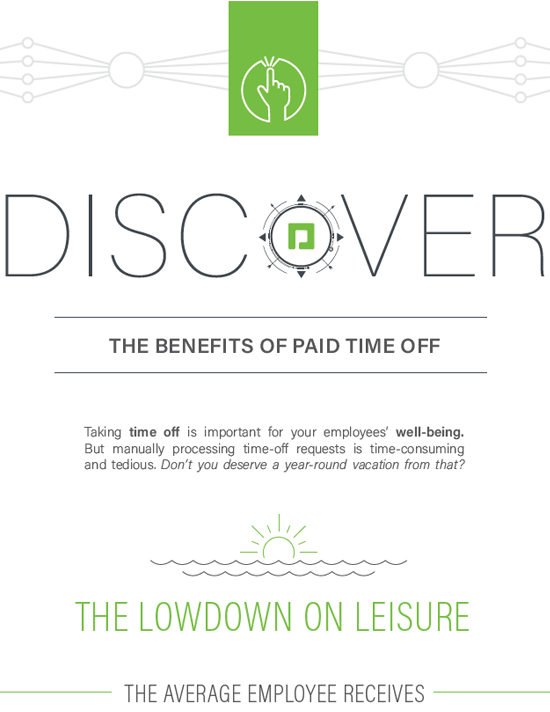 But managing PTO requests can leave you feeling like you need a vacation! Learn why it’s important for your people to take time off, and how Paycom can make managing time-off requests a walk in the park, no matter the time of year. Complete core, business-critical tasks perfectly and in less time. Assist in attracting and retaining talent by allowing employees to elect benefits with confidence and ease. Empower your workforce to manage their own HR data through a self-service tool, leaving you time to focus on strategic initiatives.